Please note the comma between ‘cheese’ and ‘squares’ – this post is not about processed “cheese” abominations. This morning I embarked on the usual chores. Once it’s light enough (and sometimes well after) I pull on my Wellington boots and venture out into the mud (known as ‘our garden’ in the summer) to let the hens out. I open their pop hole and the door that lets them out of the small run, then I go into the shed to get a handful or two of corn to scatter for them as a morning treat. Whilst they are pecking around in the corn I take a scoop of layer mash from the feed bin and go and fill up their feeder in the run before returning to the shed with the scoop. It was as I was exiting the shed after putting the scoop away that I noticed what I, at first, thought was a small, slightly muddy potato where the hens were eating their corn . I closed the door and stooped down to examine the object, which turned out to be hard and warm. As far as I can think, there is only one warm ovoid object that might appear suddenly in our garden and that’s an egg… but this one was tiny. So clearly, between the corn being scattered and me finishing the feeding (a period of less than two minutes) an egg had very quietly been laid. It’s so small I’m sure the hen responsible barely noticed – she certainly did not announce its arrival. Who laid it is a mystery… such tiny eggs used to be laid by Perdy, but she is no longer with us. Since Lorna and Tiffany are currently laying normally, I think it must be a first post-moult egg from either Esme or Anna. My money is on Esme as the colour is closest to the eggs that she normally lays. 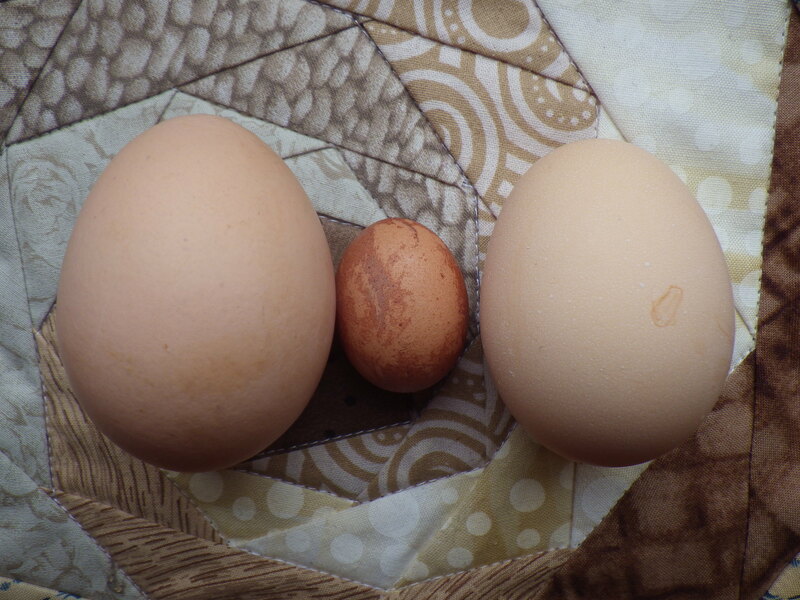 For comparison, the picture shows a Lorna egg (left) and a Tiffany egg (right) with the tiny one in the centre. Not having solved the mystery of the egg, I returned to the dry and got on with breakfast… homemade yoghurt, homemade granola and home-bottled apple (from apples grown by my dear friends at Highbank). I do love the feeling that I am managing to deliver such a large proportion of my diet without using commercially processed foods. I settled down to work and not long after that the doorbell rang… Henry the postman delivering a new insert for my diary, a book about cheese-making and a lovely parcel of crochet squares. 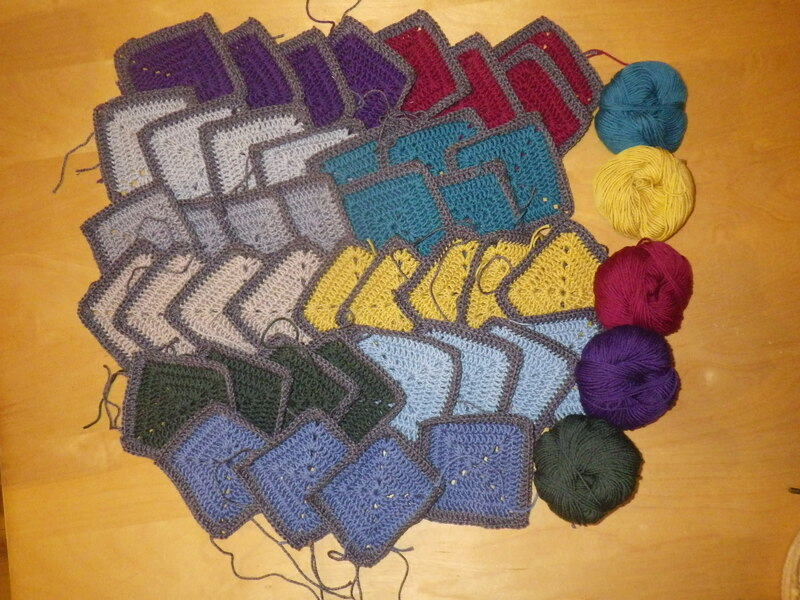 Not long ago, I had an offer of some unwanted crochet squares from Jenny over at Simply Hooked. She has been having a love-hate relationship with this particular project and had decided to let it go… offering the squares to me to use for our friendship blankets that are raising funds for Denmark Farm Conservation Centre. The squares she sent are made of gorgeous, soft merino/cotton yarn… I really hope we can do them justice. If you want a chance to win the resulting blanket, or one of our other creations, I still have raffle tickets on sale and you could also win a long weekend at Denmark Farm in the lovely eco-lodge… details of the raffle here. I must mention, at this point, that despite a lack of posts, my hands have not been idle in recent weeks. Amongst other things, I have been working on a very large granny square in my palette of blues. This is going to have its corners folded (like a traditional envelope) in to form a sofa cushion cover. It’s nearly large enough and has been a lovely relaxing project… easy on the fingers and the brain! So, what about that cheese? Well, my first attempt at cheese-making has been a success. I was able to turn the cheese on the evening that I made it (this had to be done twice) and it could be handled easily by the next day. I salted the surface and left it to drain further on Sunday. That morning I used some of the whey (non-salted and pre-treated the night before with lactase enzyme) to make raspberry and white chocolate muffins. The young cheese is firm and crumbly, with a mild creamy flavour. Sprinkled with some freshly ground pepper yesterday and served with homemade bread, it provided me with a very acceptable lunch. In the evening, I crumbled some into baked potato scooped out of its skin, then mashed it up and added a little fried bacon. The resulting mixture was returned to the baked skins, topped with a little local cheddar and grilled for a very tasty dinner. I’ve had a hard time writing this post today. I heard the news about the shootings in France when I was part way through and I wondered whether to continue as I was so upset. But, in solidarity with all those who write – and draw – about the world around us and continue to have the freedom to do so, I completed my post (with tears in my eyes). Let us continue to prove the the pencil truly is the most powerful weapon. If cheesemaking were predictable, it would rapidly lose it’s fun element for me! It’s the fact that each cheese is slightly different which I find most appealing. At the end of the day, even if what you set out to produce doesn’t quite work out quite as intended, you’ve still got a delicious and nutritious end result. Great point… and I quite like a surprise! With cheesemaking, half the time unpredictability is due to wild cultures which are floating in the air all around us, and which are how cheese was originally made. Since you’re working at home and not in a sterile dairy environment, your results will vary, and the art of cheesemaking will lie in making friends with your wild cultures and taking advantage of them. It will be helpful to keep a notebook saying exactly what you did each time, down to the pots and pans used, because that may help you identify what was different if something goes wrong. Good point… in fact I have already noted down one or two things in the back of the instruction book,,, perhaps I should have a special cheesy notebook! Congratulations, you’ve made huge progress in such a short time with the cheese. I can see it being a regular event now. Wiping out people who give voice to freedom of speech isn’t going to stop people from doing so, it is going to galvanise them into more action. I, too was shocked by the news out of France today :(. Kudos on your cheese making. Taking notes is a great idea (in practice) but I always forget to do so in the heat of the moment which leads me to repeat the mistakes that I made last time, the next time I make certain recipes ;). We had a tiny egg like that one when one of our young girls started to lay. Apparently they are common in point of lay hens and hens that are at the end of their laying time. I dare say you are right about it being an after moult egg. Let us know if you find out :). What a pretty cover you’ve made. It’s so cheerful. I have greater appreciation now for the little cheese I get to eat. If I had to make it, I’d probably not eat any. I was in my 30’s before I found out where fruit came from and what to do with it. Yes, it was a very odd life. I thought everything came from a package. Having chickens sounds so wonderful. It sound like a great life to live. I’ve never made cheese, nor have I ever raised chickens. I just might try the cheese, but probably not the poultry. My heart bleeds for those in Paris….such a senseless act of violence. Really enjoy your blog. Thanks! Thank you. Interestingly I think the chickens may be more predictable than the cheese! 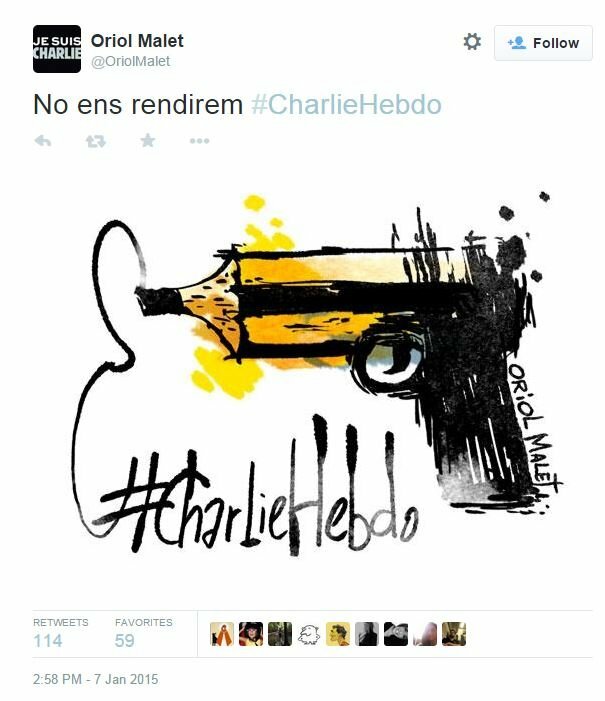 Completely agree with you about the shootings in France. Love your idea for the cushion! The cushion is strange… a simple granny square transformed by turning it 45 degrees. Who would have thought?! I also love that you are still able to eat fresh eggs from the garden (no matter what their size). Ooh… more squares would be fab! I’ll e-mail you! ps. a rogue, roving bantam?